ARLINGTON, Va. -- General manager George McPhee's response was simple: The Washington Capitals aren't winning enough games right now. There are other issues as well -- the defense has been leaky, the star forwards aren't scoring enough, the goaltending has been suspect. It all added up to a decision McPhee felt he had to make -- Bruce Boudreau is no longer the coach of the Capitals, and Dale Hunter has replaced him. "The reason for the change was we weren't winning, obviously, and this wasn't a slump," McPhee said. "You can ride out slumps. This was simply a case of the players were no longer responding to Bruce. When you see that, as much as you don't want to make a change, you have to make a change. Bruce did a terrific job. We're very proud of him, proud of the work he did for us, but when the players aren't responding, you have to make a change. "The issue was we weren't playing very well. And I think Bruce came in here and emptied the tank. He gave it everything he could and did a really good job, but the tank was empty. When that happens, you get a new coach, where the tank is full, and see if it makes a difference." Boudreau helped revive this franchise, molding the Capitals into the one of the top teams in the League and filling Verizon Center with red-clad fans on a nightly basis like never before in the team's history. He was the fastest coach in NHL history to 200 wins, and the Capitals were consistently one of the elite teams during the regular season in his tenure. Postseason success never followed, as the Capitals have won only two playoff series in the past four years despite being a top-three seed in the Eastern Conference each time. The end for the much-liked Boudreau did not come because of postseason problems, but rather a 5-9-1 stretch since the team began the 2011-12 season with seven straight victories. It is not just that Washington currently sits eighth in the conference. The problems go deeper. The Capitals have allowed 72 goals, an average of 3.27 per game, which is 29th in the League. There have also been decisive defeats -- four lopsided losses in the past six games alone. The last was 5-1 Saturday night in Buffalo against an injury-riddled Sabres squad. "I didn't like some of the things that I saw in training camp, in some of the preseason games. I don't want to put too much into that. But I was worried then," McPhee said. "And then we had a great start, and then we started to slip up, and you have an injury here or there that you think is part of it, but ultimately we have too many players that aren't playing well, and that's what it comes down to. They can play better. So you have to find out how you can make them play better and we think this is the solution. "These are always difficult decisions, but as I said, you don't want to make these decisions, but when you see what I saw, you have to make the decision. You can't look the other way. And I've seen it in a few games recently, enough that I knew the team wasn't responding. We've got their attention now, and hopefully they'll respond in the right way." Now McPhee will turn to one of the franchise's most popular players to help revive his wayward club. Hunter coached his first practice Monday with the Capitals at the team's practice facility, and a large banner with his No. 32 is one of four that hangs at one end to signify those that have been retired. Hunter played more than 1,400 games in the NHL, including 872 with the Capitals from 1987-99. He was the team's captain for five seasons, and his 100 playoff games in a Washington uniform is tied for first in franchise history. "Hopefully [he brings] the same things that he brought as a player," McPhee said. "Obviously Dale was an intelligent player, he had talent, and he was tough. And he was downright mean sometimes. We probably won't see a player like that again for a while. You don't see numbers like the numbers he's had. But he played 19 years in this League, and I think the best thing you could ever say about Dale Hunter was, whether the game was at home or away or whether he was injured or healthy or whether we were winning or losing, that guy played the same way every night -- and it was hard." After Hunter's playing career was over, he and his brother Mark bought the London Knights of the Ontario Hockey League and have turned the franchise into a junior-level empire. The Knights won the Memorial Cup in 2005, and Hunter's .691 winning percentage is tops in the league's history. Hunter has coached many players who have become NHL stars, including Patrick Kane, Corey Perry and Rick Nash. He also was one of the biggest reasons current Capitals defenseman John Carlson played for London instead of going the college hockey route. "[Hunter] went back, like a lot of guys do, and started coaching at the junior level, and no one's been better at that level," McPhee said. "In that Ontario Hockey League that's been around forever, he has the best winning percentage of all time. And it's not a flash in the pan, one or two or three years -- it's 11 years. He's turned that franchise into the best junior franchise going. He is a terrific coach, and I think that this is a great resume to start with -- someone who played in this League for 19 years, was a team captain that anyone who played with him really admired and revered him. And then to go coach for 11 years and come to this franchise, I think it's a great resume to start with." 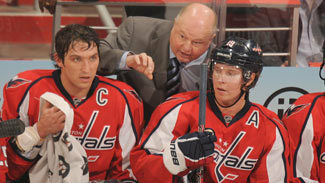 The Capitals were dead last in the NHL when Boudreau took over on Thanksgiving Day in 2007, and he rallied them to the first of four straight Southeast Division titles during his tenure. Hunter steps into a better situation -- the Capitals are only three points shy of Florida for tops in the Southeast and this roster is far superior to the one Boudreau inherited. That's on paper, at least -- Hunter will have to get some of the team's top players to perform up to the expectations created during previous seasons with Boudreau. Alex Ovechkin, who McPhee was adamant will remain captain, is chief among them. Ovechkin has 8 goals and 17 points in 22 games, and is on pace for the worst year of his career. "I don't think this has anything to do with Alex Ovechkin," McPhee said. "I think it's got everything to do with this team not playing well. Our goalies aren't stopping pucks. The defense aren't getting the pucks out. And the forwards aren't checking and scoring enough. It's our whole team. It's not an individual. We have a lot of players that aren't playing the way they're capable of playing, and that's why the change is made." Hunter is the fourth consecutive coach McPhee has hired who did not have any NHL head coaching experience. He's also the first who is a revered figure among the franchise's fan base. "This is the only team he's ever wanted to coach," McPhee said of Hunter. "He's had opportunities with other teams, but this is the one he's wanted to coach. And we've talked consistently over 12 years; I was always hoping that one day Dale could coach this team. But timing's everything, and the time is right now. His kids are grown up, his [London Knights] franchise is in great shape. He's available and ready to do this now. And the only way he wanted to do this is if he could go full-bore, in his words. 'I've got to be able to go full-bore,' and he's ready to go. "As I've said before, coaching's coaching, and he's been coaching at a good level and at a high level. The same questions were asked of Bruce when he came here, and he had an outstanding record. The man's played in the League for 19 years. He's played for a lot of coaches. Dale really understands this game. He knows two things -- farming and hockey. He's really good at them both."